This is great, another nice lottery name to add to our collection! It claims to be from Bankok, Thailand. Just imagine how much money this scammer has made over there years – he is travelling all around the world and sending out scam mails, at the expense of his victims. If you found this post by using the search engine, please note that you have received a scam email. The scammer is trying to rip you off by asking you to pay a fee in order to collect the $1million winnings. As we always say: NEVER PAY MONEY TO GET MONEY! You will never get a single cent after paying for the winnings. Please read this out loud and delete the email. We would have saved you some hardearned money. Lastly, forget about reporting the names found in the email to the police. They are all fake names. the 21st of FEBRUARY 2009. CLAIM AGENT and do not forget to summit the following to the Claim Agent. played the lottery in your name. 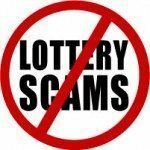 Lottery Scam: EuroMillions Lottery International – 1million Euros!